Soon the unused capacity of EV batteries will be used to make the power grid more efficient. We’re on the verge of the acceleration phase of electric vehicle (EV) penetration. This not only promises a leap forward in the de-carbonization of personal transportation, but also allows utilities to provide modernized grid management and deliver lower-cost energy to consumers. Smart charging from the grid (V1G) is in widespread operation today. The benefits are well-known – it lowers the cost to consumers of charging their vehicles, and helps energy suppliers respond better to energy demand by spreading peak loads. Without demand response management, McKinsey estimates that an EV adoption of 25% at the neighborhood level in Germany would increase peak loads by up to 30%, far beyond the capacity of current substation design. The next stage in vehicle-to-grid integration (V2G) holds even greater promise. Bi-directional flow of electrons and communication between grid and vehicle offers a solution to the very problem EVs create – it helps balance the load curve of the intermittent generation of renewables, on the supply side, with peak demand from increasingly electrified households. This mobile fleet of unused battery capacity is waiting to be unlocked and monetized – a 21st century rebirth of the Duracell bunny that can keep the grid going and going… and going. Connecting electric vehicles to the grid is not a new idea. It has walked a slow path of pilot projects and limited commercial rollout, varying with geography and dependent on support from the carmakers. Nissan has led in Europe, partnering with utilities in Germany and the UK. There are clear technological gaps to fill, none small but none insurmountable – from standardization of communication protocols and charging inverters to managing battery degradation. With the latter, trials have shown that smart algorithms can optimize battery charging if given clear signals about user demand and battery design. Such systems have not yet been commercialized and will require robust infrastructure along with detailed data from households. Without these, grid-connected vehicles will remain less intelligent and likely uneconomic. As for “range anxiety,” this bias against EVs can only be overcome with continued leaps forward in battery capacity. It’s understandable – if your smartphone dies, the chances are that your next Instagram post can wait. But being stranded on the highway is a different story. Today’s EVs already have capacity to spare for most trips. The battery in a Nissan Leaf stores 30 kilowatt-hours (kWh). That’s enough to drive the Leaf 107 miles (172 km). A Tesla Model S 90D with 90 kWh extends this to 294 miles (473 km). Contrast these ranges with US Department of Transportation data for 2017 showing that 75% of single trips were less than 10 miles, and 95% were less than 30 miles. Commercializing V2G will deepen the convergence of the transport and utility sectors. In its purest form, grid operators will be rewarded with a more reliable system and a reduced cost to operate. The value of this could be huge, particularly when capturing frequency regulation, which is essential for keeping the grid reliable – Imperial College London has estimated that V2G could generate savings of up to £3.9bn a year for the UK grid in a scenario of mature EV penetration and renewable generation. Fair distribution of this value is key to developing the market and aligning stakeholder incentives. Consumers can become prosumers with a new revenue stream to offset their energy bills, while automakers benefit either directly, or by sales growth from accelerating fleet modernization. In this scenario, it is not hard to imagine a grid operator offering the likes of UPS or FedEx a rebate to partially fund compatible EV purchases – this initial outlay could still be far below the capital expenditure required for alternative grid-level storage solutions. Residential V2G will follow suit, because once a platform exists to easily trade excess battery capacity on the grid, it becomes is easier to tackle localized demand response for households. Macro trends in the transport and energy industries will provide the environment for V2G, and other cross-sector initiatives, to flourish. We expect Europe will emerge as the leading region for V2G innovations, born of necessity due to its forward-thinking attitudes toward resource management and de-carbonization. As renewables increase as a proportion of electricity generation, the pressing need for a backbone of demand response and storage solutions will only increase. EV penetration growth will serve as a multiplier. 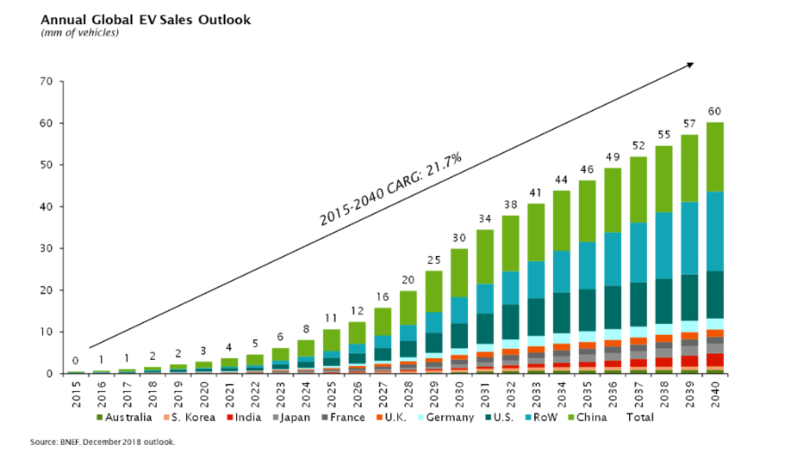 By 2050, BNEF estimates that 55% of new car sales and 33% of the overall global fleet will be electric. In pockets, this will arrive far sooner – in San Jose, California, the installed base of cars is already 13% electric. China and the US. will lead the race in terms of sales. Automakers may find it difficult to retool their manufacturing operations away from internal combustion vehicles, but they must ultimately fall in line with electrification. Pursuing leadership in the development of bi-directional charging offers opportunities to monetize EV storage capacity and accelerate EV adoption.